Ecole Brechbuhl is a private primary school located close to the Russian Church and Geneva old town. It welcomes around 200 children from 3 to 12 years old split into the 9 classes of enfantine and primaire. Originally opened in 1875 for children from the prominent families of Geneva, it now accepts students of all nationalities and religions. Nevertheless, Ecole Brechbuhl strives to instill in children protestant values representing the Spirit of Geneva: tolerance, responsibility, respect of others, love of learning and work. Ecole Brechbulh cherishes its friendly family atmosphere and ensures personal attention to each child. Both teachers and the administrative staff are available throughout the year to meet the parents, should they wish to discuss the child’s progress or any other concerns. Parents can also track their child’s development through the notes and the bulletins regularly sent to them by Ecole Brechbuhl. The school day generally lasts from 8 45 (8 am starting from 6th form) until 3 45, with the two hour lunch break in the middle. Students have a choice of either taking their lunch at home from 11 45 till 13 45 or eating a hot meal delivered to the school by a caterer. The youngest students finish at 11 45, but may remain at school till 15 45 for the afternoon class. There is also an afterschool care until 17, when the children can get help with their homework. 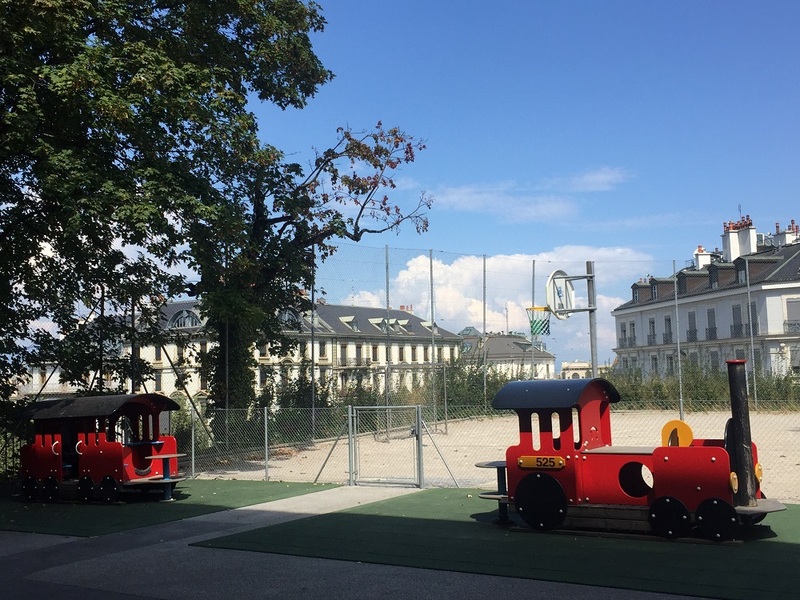 Due to Ecole Brechbuhl’s central location the school’s grounds are not large, but children can still enjoy outside breaks on the playground overlooking Geneva. Ecole Brechbuhl teaches in line with the Swiss curriculum with the added emphasis on mathematics and French. English classes start from 1st grade, with the special programme for English speaking children. The school also offers classes in German, Latin, informatics, theatre (in English), sport and acquaintance with art. Being a protestant school, Ecole Brechbuhl includes Bible studies in the curriculum, which in the 7th and 8th form are substituted by the comparison of the world’s main religions. Individual help is available for students facing any difficulties as well as any new students who need a bit more time to catch up with the Ecole Brechbuhl’s programme. Unlike many other private schools in Geneva, children are signed up to Ecole Brechbuhl soon after birth and the places fill in quickly. Children can start class enfantine if they have turned 3, or 1st form if they have turned 4, by 31 October of the proposed year of entry. This is a much more lenient policy compared to public schools for which the cut-off date is 31 July and many other private schools which set it on 1 September. Ecole Brechbuhl believes that to ensure successful learning the level of students’ knowledge in class should be substantially homogeneous. For this reason any student seeking to join Ecole Brechbuhl from the 3 form onwards should take an entrance test. Rather than being a form of selection, the aim of this test is to ensure a successful assimilation in the class.